Definition at line 190 of file setupapi_private.h. Definition at line 194 of file setupapi_private.h. 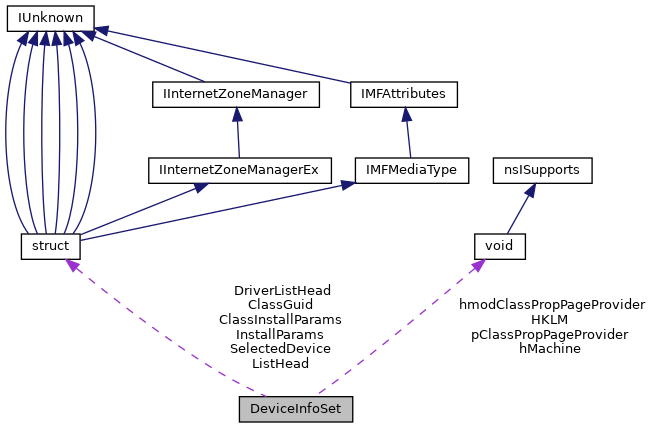 Referenced by SetupDiCreateDeviceInfoListExW(), SetupDiGetClassDevPropertySheetsW(), and SetupDiGetDeviceInfoListClass(). Definition at line 212 of file setupapi_private.h. Definition at line 205 of file setupapi_private.h. Definition at line 196 of file setupapi_private.h. Definition at line 198 of file setupapi_private.h. Definition at line 215 of file setupapi_private.h. Definition at line 201 of file setupapi_private.h. Referenced by SetupDiBuildDriverInfoList(), SetupDiCallClassInstaller(), and SetupDiSetClassInstallParamsW(). Definition at line 208 of file setupapi_private.h. Referenced by IsDeviceInfoInDeviceInfoSet(), and SetupDiEnumDriverInfoW(). Definition at line 221 of file setupapi_private.h. Definition at line 192 of file setupapi_private.h. Definition at line 216 of file setupapi_private.h. Definition at line 209 of file setupapi_private.h. Definition at line 224 of file setupapi_private.h.